Lots of you will have seen that I have posted a few photos of Ranunculous over the last month or so via facebook and Instagram. According to the language of flowers, their meaning used often as a secret message in Victorian times is ‘I am dazzled by your charms’. This message is still relevant for me today! I am definitely on the list of people who is ‘dazzled’ by this flower, I love seeing how their petals unfurl to reveal an intensely pretty colour or tone. I managed to get a bunch of snowy white from my wholesalers just as they were coming into Season for Ceri and Andrew’s Wedding back in September, they worked beautifully with their Anemone friends at the time. Now we have entered the New Year and approach spring time the rainbow of colours available is just magical. Knowing when particular flowers and colours are likely to be available is something as a florist comes with experience and a good relationship with flower growers and wholesalers. The Ranunculous I have bought flowers from my wholesalers most recently have been grown in Italy, however the British Flower industry is stretching the season and producing some amazing flowers of absolute quality which rival the flowers imported from Holland. My plan this year is to where possible shop around and source the best flowers, supporting fellow small business owners in our local area. Whilst away on at Jay Archer’s Flower School back in October, I was lucky enough to be working on the same bench as Bella, who with her family is creating West End Flower Farm, a British Flower farm. When we met the polly tunnels were about to be installed onto their fields, and the ground was being prepped for bulb flowers. I’m genuinely enjoying watching Bella’s family’s adventures as they develop their flower farm. You can see how their flowers grow via their Instagram account @WestEndFlowerFarm. Fingers crossed I can buy from West End Flowers when their cutting season starts – so exciting! Knowing how flowers grow, and often where is really helpful when creating displays and styling them. Ranunculous like to grow in moist conditions, near water. Like most bulb flowers, when they are cut, they are happiest sitting water rather than old fashioned floristry foam. If they’ve had a good drink, they can also do well out of water in bouquets, button holes and crowns. Worn close to the body, they will unfurl even more and reflect light just like their magical cousins the buttercup. p.s. 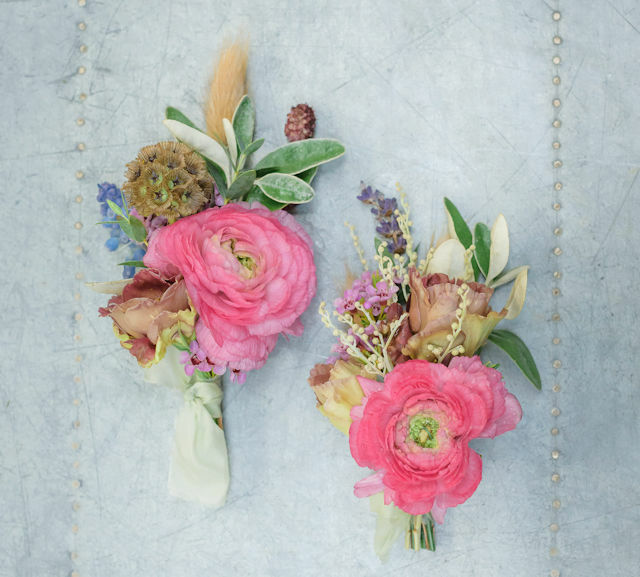 The photo for this blog shows a ‘his and hers’ buttonhole set I made at Jay Archer Flower School, photography Ria Mishaal.